Our home is an 1800s built Tuscan Colonica (farmhouse) located approx. 19 kms. from Firenze. The house is set within a large lawn, olive grove (150 trees) and traditional Tuscan cypress park, which are part of the property. It has been completely restored and has four levels with 5 bedrooms, 3 new bathrooms, live-in kitchen, dining room, living room with a design fire place area, and a groundfloor attached apartment with private kitchen and bathroom/shower and private direct exit on the garden. The decor mixes contemporary Italian design and antiques, which makes the house unique and functional. The 8x5 mts in ground pool which overviews the hills is ideal for children and adults alike. The stone terrace with dining and living area is stunning. The views from every corner of the house and garden are stupendous as the property is located in a dominant position atop a hill with 360 degree views of castles, the river Arno, the hills, vineyards, and olive groves. 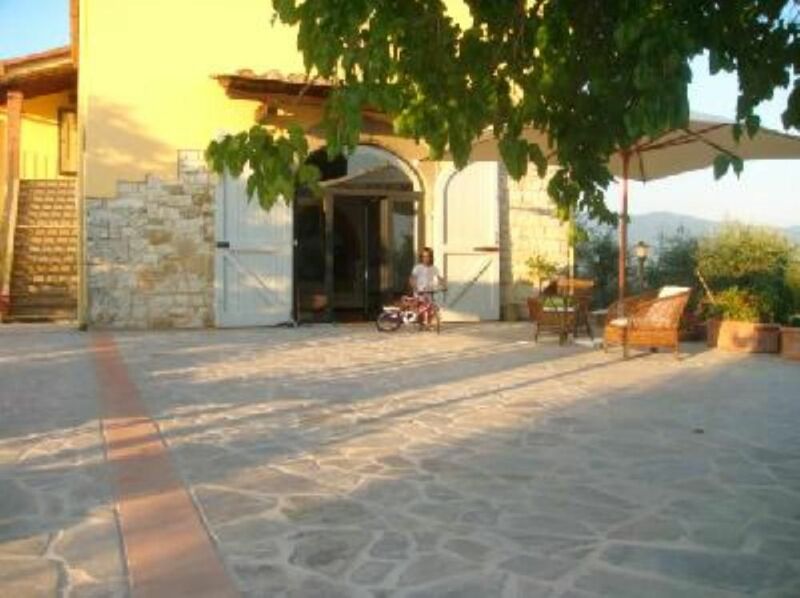 The property is at a close distance from Florence and many other famous historical and cultural sites, like the city of Arezzo, as well as prestigious wine cellars and restaurants. Horse riding facilities, and tennis courts are five minutes away, and there are infinite options if you are into running or mountain bike. For the shopper, the most prestigious Luxury Outlet Mall in Italy (THE MALL) is located 10 mins. away. In order to be able to explore and take advantage of visiting the Tuscan countryside, a car is recommended and necessary. From Florence, one passes through Bagno a Ripoli, taking via roma about 8 kilometres, then turning left on the provincial highway towards Rignano Sul'arno for about 2 kilomteres. One goes straigh on Via di Antica about 300 meters and finds the house. The house (a yellow colonica in the middle of hundreds of cypress trees) can be seen from all parts of the valley as it is in a dominant position. From the Autostrade, one exits at Firenze Sud and heads approx. 8 kms. towards San Donato in Collina and then follows the same directions as above. There are so many lovely, typical Tuscan things to do in the area. Given the extremely close proximity to Florence, day trips are a breeze either by car or train (2 kms. from house). There are innumerable small and large towns in the area to visit for great cultural and gastronomical tourism. Immediately in the vicinity (within 100 meters or 1-2 kms.) there are numerous castles, vineyards, restaurants where one can visit and sample local wine, olive oil and products. A list of recommended sites is available with personal introductions and/or group planning assistance at any of the neighboring castles, cantinas, vineyards, etc. possible upon request. Also upon request, a private cook/chef from the area can prepare a typical lunch/dinner for your group. There is fantastic walking all around the house with stunning views and pristine nature. For those that enjoy visiting churches or attending mass, there is a lovely 1700s church and monastery within walking distance. Downpayment / Deposit requested. Security deposit requested. Discount depending on length of stay. Owner not present on location. Rate depending on the number of persons. 24 hour assistance available as needed. Cleaning service available upon request. Chef service available upon request.